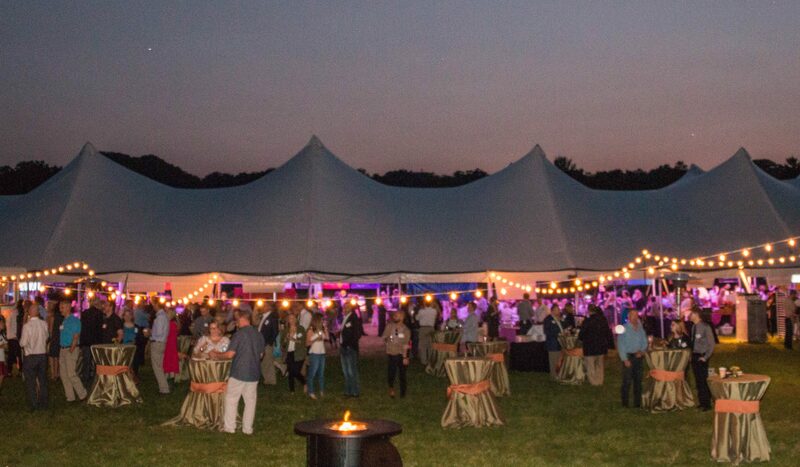 Sept. 27, 2017 — A sell-out crowd of 600 gathered under a large tent at our 7th annual Chefs Unbridled event Sept. 16 on the grounds of The Hunt Club in Gates Mills raising more than $250,000 for Fieldstone Farm and our programs for veterans. This is the most ever raised at one event for Fieldstone Farm. We are extremely grateful to everyone who supported this major fundraiser. Thank you all! The evening was dedicated to the more than 200 military veterans who work with our horses at the farm. The crowd was still as it watched a short video recounting the stories of several of the vets whose lives have been forever changed from their experiences with our horses. Click here to view the video. A big shout out goes to our sponsors including The Kuhn Family Foundation, Bill and Becky Crowley, Davis Auto Group, The Harrington Family Foundation,The Robert Kaplan Family Foundation, Jim and Andrea Thome, The Wolf Foundation, Yopko Penhallurick, LLC, and Chefs Scott Kuhn and Chris Hodgson led a team of Cleveland’s all-star chefs serving up culinary creations for all to enjoy.